When we started to move Matt’s furniture in we realized that the configuration of the living room was going to pose a problem. 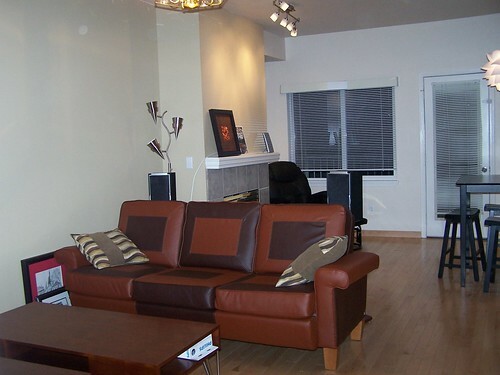 The fireplace- while nice- was placed on a wall just so that it made the only way to put a TV in the room is to mount it about the fireplace. That would be fine if Matt didn’t already have an awesome TV stand and matching coffee table. We tried to wrap our heads around it and I finally looked over at the dining room and said- “Lets put the living room in the dining room and the dining room in the living room. Ironically it worked and I wouldn’t have it any other way! 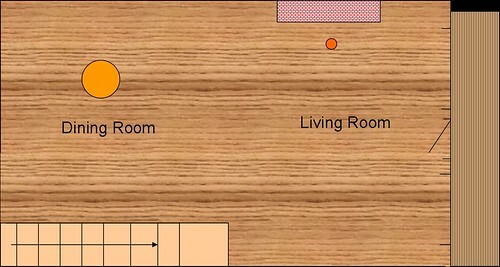 the space before- the circles represent the existing lighting placement in the room. 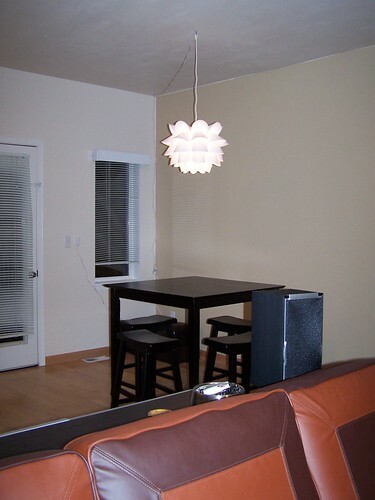 For lighting, we got this great plug in flower petal light at Ikea for under $30. 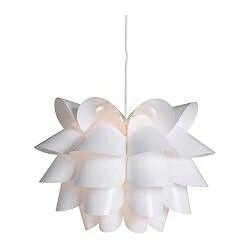 This one was at Lamps Plus for just under $200- I think we got the better deal at Ikea! I bought a plug in dimmer switch for $10 and mounted it on the wall next to the other light switches. 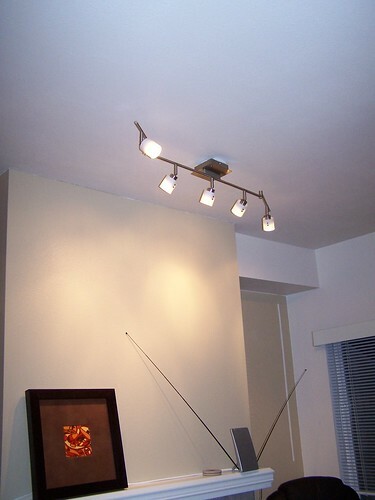 We replaced the single spot light above the fireplace with and IKEA 5 spot light track. The light plate in the ceiling was too small so we’ll have to install a larger plate and rehang so it is flush with the ceiling, but it will do for now. 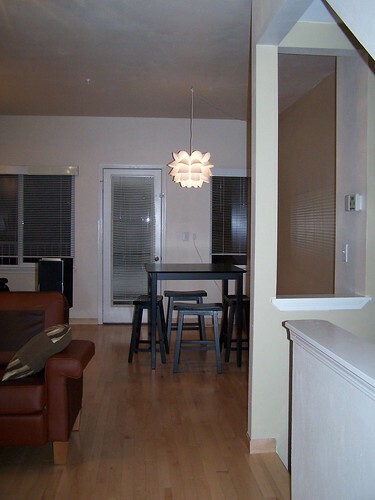 We still haven’t found the right light for the “was dining, now living” room. 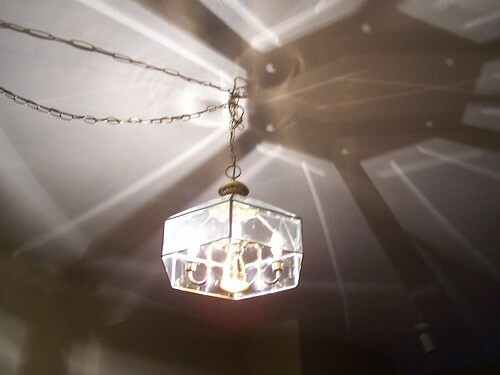 We’re looking for a crystal chandelier that is really over the top- something without brass-silver or black tones- but really a kitschy piece. Brass lamp needs to go! The space needs a little tweaking but overall it’s done. Yay! 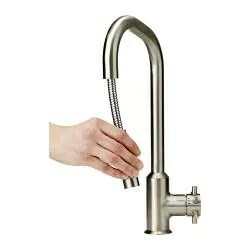 Next on the list- tackle the rest of the lighting in the house, refurbish the lockers, and replace the kitchen faucet with this piece I bought at Ikea. just have to install it!